Construction: Investment-cast aluminum light housing; extra thick injection-molded polycarbonate plastic lens with 5-40 Phillips head mounting screws; die-cut rubber base gasket and internal LED spacer gasket; custom 15-element LED board with two phases (brake light and running light) and three wires (ground, brake and running lights); 1/4-20 hex bolts for mounting through the underside of rear fender. Fitment: Rising like a Mako shark on the back of a motorcycle fender, Biltwell's first taillight looks like the dorsal fin on the ocean predator of the same name. 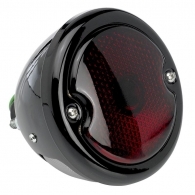 The Biltwell Mako taillight is for custom applications only, and will not retrofit to any stock motorcycle without several hours of easy drilling, wiring and soldering. If you can change a light bulb, you can ditch the giant taillight on your stock hog to make room for this tidy little taillight. Details: The Mako is approximately five-eighths the scale of the classic Sparto taillight that inspired it. 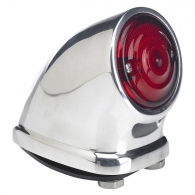 The outside diameter of the red taillight lens is 1-5/8 inches, so it’s small. 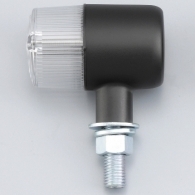 When illuminated its LED is easily visible at 100 meters in pitch darkness, but due to its small size it may not pass safety inspection in your state or country of registration. 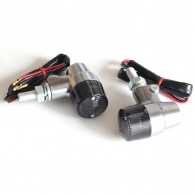 This is a custom component for handcrafted motorcycles, so the DOT-worthiness of such vehicles is always dubious. If you’re looking for laser brightness from outer space, this isn’t your taillight. Задний фонарь Mako - Хром 3420грн. 8040руб. 120.00usd. 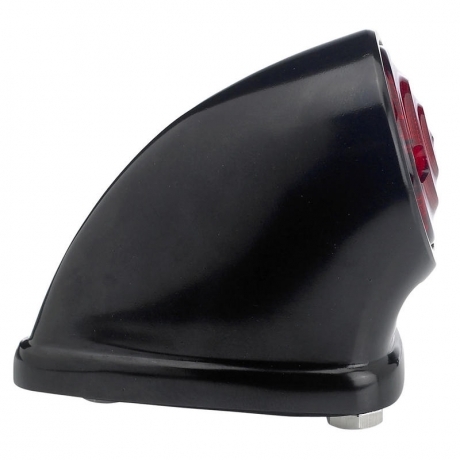 1933 - 1936 Ford Blacked Out Tail Light for your bobber or chopper 2280грн. 5360руб. 80.00usd. Поворотники Posh 2050грн. 4820руб. 72.00usd. Поворотники - K & S 1850грн. 4360руб. 65.00usd.